Kids on bike racks: jump in the pool! This has become a familiar sight. I don’t remember when I noticed my kids liked climbing on bike racks. I assumed at first it was just my kids, until I started seeing photos of other peoples’ kids also climbing on bike racks. What is it with kids and bike racks? The attraction is so strong that we have seriously considered installing a bike rack in our basement. It would make it easy to lock the bikes but the thought of drilling into concrete is pretty unappealing. And of course our basement floods, so it could end up looking a little gross. When I commented on one of A Simple Six’s photos of her kids climbing on a bike rack, she suggested I create a Flickr pool, and I thought, yeah, right. What I know about Flickr could be written in crayon on the rim of a shot glass, to quote David Foster Wallace. But in the spirit of lifelong learning I recently went to Flickr and figured out how to create a “Kids on bike racks” group pool. 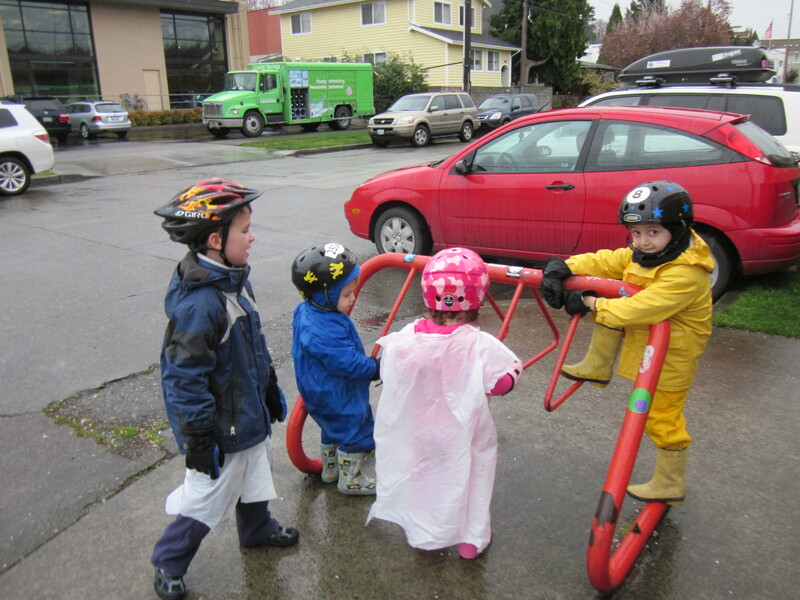 Do you have a picture of kids treating a bike rack like a jungle gym? Or a ballet bar? Or a tunnel? If so, I’d love to see it. My husband got a bike rack from his work. They were throwing it away so he took it home. We plan on installing it into our backyard. I can’t wait! Ha! For some reason neither Matt nor I have ever felt the urge to climb a bike rack that I can recall.